I’m on a frantic search through the boys’ bookshelves. My husband is reading a Frog and Toad story to our youngest, our two year old. They are laughing together through the story. My husband calls to me, asking where the other three Frog and Toad books are. He knows we have them – we used to read them to our oldest son when he was two. I’m looking everywhere but I can’t find them. My eyes fill with tears as I realize that the books are probably packed away somewhere. Buried in a box with all of the other stories that we tried to read to our middle son Howie. Stories that he never showed any interest in. All three of my boys have bookcases in their rooms. Every shelf is filled. I never say no in the bookstore. My oldest and youngest have books strewn all over their bedroom floors. My middle son – his books have been in the same place for…years. I can’t remember the last time he took a book off his shelf and brought it to me to read. We’ve tried. He won’t sit for a story. 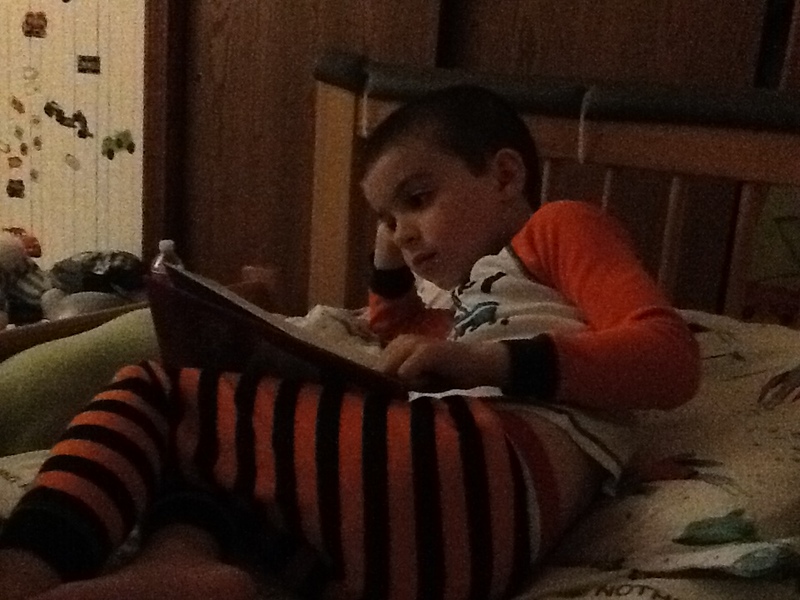 If I’m reading to his younger brother, he’ll come over to listen sometimes. But he never initiates it. When he was younger, he’d sit for a story with my husband. They had two books that they would read, Hondo and Fabien and Night Driving, both by the same author. But then things changed. Was it that he couldn’t sit still for them anymore? Or did his obsessions and sensory issues get in the way? Is it the autism or did we get so busy with helping him with everything else that reading just fell by the wayside? It’s that hope that keeps me on the hunt for those missing Frog and Toad books. On May 7, 2013 I sent Howie’s teacher an email. I never thought those would be words I would write. Thank you for teaching him to love to read, to learn, and to appreciate the details. And I sent her this picture. It’s where I found him while he was waiting for his turn for a shower. My eyes filled with tears again. And now I am back on the hunt for those still missing Frog and Toad books. That feeling you get when you turn around and your child isn’t there. I could tell you about the time when we were in a hotel near StoryLand in New Hampshire. Howie was three. We were staying in one of those two room suites where you could close off the bedroom from the other part of the room. I had baby Lewis ready for the shower, and I went into the bedroom part of the suite and handed him into the bathroom to Tim. Howie and Gerry were in the other room. Gerry was watching a Red Sox game on the TV. I come out of the bathroom and Howie is gone. I check in the closet. The drawers. Behind the table. Is he hiding from me because he doesn’t want a shower? Playing a game? Both rooms together are about 700 square feet. He’s nowhere. “Howie!! Howie! !” But I know full well he won’t answer to my screams. After what seems like a lifetime, I notice that the door to the room is slightly ajar. I run out into the hallway. At the end of the hall I see Howie. In nothing but a pull-up. I grab him just as a man comes out of his hotel room. “I looking for you.” he said. He was trying to find where I was when I went into the bathroom. The door to the hallway looked like the door to the bedroom in our hotel room. He opened the wrong one and left. I could tell you that I know I am lucky that my kids aren’t bolters. For the most part they stay with me in unfamiliar and familiar places. But they lack impulse control. They don’t answer to their names when called. And all it would take is that One. Split. Second. But there are many children who do run. With no sense of fear or danger. Kids that will follow a butterfly down to a creek or decide it’s time to leave and get in the car and lock themselves in. These are my friends’ stories. And their friends’ stories. I could tell you that three little ones lost their lives this week after wandering and drowning. Three. To honor Mikaela and Owen and Drew I am doing one thing today. I am printing out the First Responder profile form for my kids and bringing it to our local police and fire departments. It’s on page 10 of this PDF. It has a info sheet with tips for searching for an autistic child and how to interact with a child once found. It has a spot for a recent photo. It’s one more layer of protection for my boys. I urge you to do the same for your child too. My heart is with the Lynch, Black and Howell families today and always. We are with you. Two different kids. Two different scenarios. In Howie’s first grade class, the kids take a math timed test every Friday. They start in November with what they call “little plus” questions. It’s 50 addition problems on a sheet, adding numbers from 0-10. The kids have three minutes to complete the 50 questions correctly. The goal is, of course, to learn and practice their math facts. I knew from the beginning that this would be a big challenge for Howie. I even mentioned it at his kindergarten to first grade transition meeting last May. It’s not that he couldn’t learn the facts – his academic abilities have never been the issue. It’s the processing speed. And the fine motor skills for writing the numbers quickly. And the anxiety. And his highly competitive drive. All of these issues had the potential to come together in a perfect storm of frustration and meltdown for him. I thought this was a recipe for disaster for him, that there was no way he could answer all the questions in that time limit. Nor did I think he could handle seeing the other kids complete the task when he couldn’t. Immediately I suggested we think of accommodations for him for the test. I even bought a book called “Last to Finish: A Story About the Smartest Boyin Math Class“. “Let’s wait and see how it goes,” was the response back. Every week he tried that test. Sometimes he’d complete 39 of them with the answers all correct. Other weeks it was 42 with a few wrong. 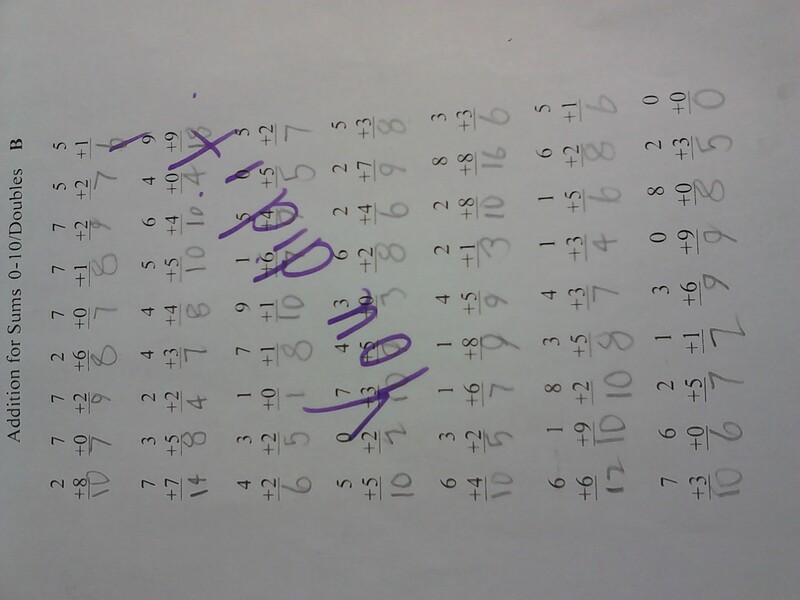 One time he completed the whole sheet but had three wrong. Every week he tried. No meltdowns, no frustrations. His aide and teacher worked with him on calming techniques before the test and during the test and they had him stand up in front of the class to teach the other kids how to stay relaxed during a test. They taught him where he needed to be by one minute and by two minutes to complete the sheet. They practiced outside of class and sent home sheets for us to practice at home. He never mentioned if the other kids had moved on to the next “little minus” sheets. Every week he tried. And every week he came up just a little short. He just couldn’t do it. He jumped into my arms for the best real hug ever. Spatial relations have never been a huge strength for Lewis. He doesn’t have a very good sense of where his body is in space – meaning he will often misjudge how close he is to a door handle or a corner on a counter top and walk into it or take a misstep and fall. It’s clear he gets this from me, as I have misjudged the amount of space between my side view mirrors and the opening of the garage. Three times. I can never accurately tell how close I am to the curb when parallel parking. Lewis and I also don’t like the feeling that we’re going to fall. For example, he’s very uneasy walking on a bridge on playground that you can see through. I don’t like climbing stairs that are open. Lewis was especially afraid to sit up on a swing. He would lie down on his belly on a swing with no problem and fly. But sitting upright? Nope. No way. So I talked with his home ABA therapists about it and we made it a goal. He needed to learn how to swing. They started small with just sitting on the swing for a few seconds with the therapist behind him. The next time he’d sit a little longer. Each time they’d say “It’s time to swing” he would say no. But then he would. For little bits at a time. Several weeks of this passed. 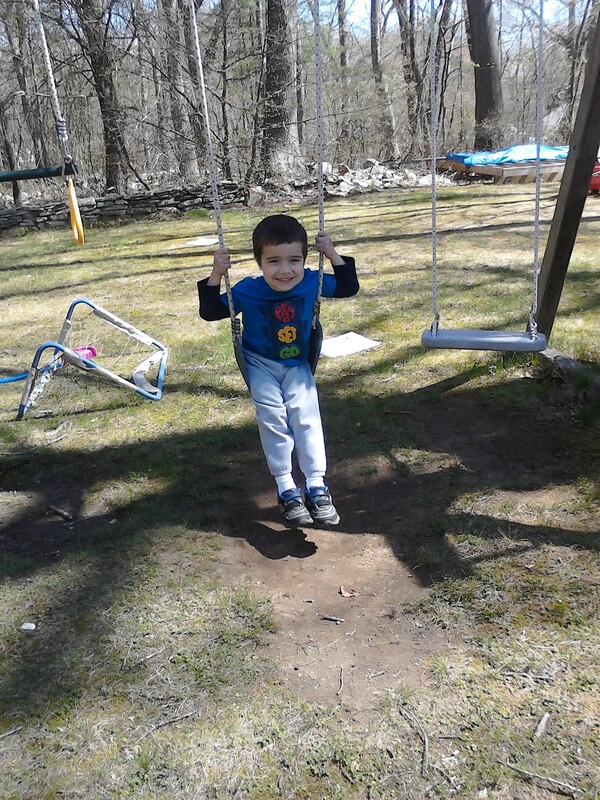 He just refused to sit there by himself and he melted down at the suggestion of a gentle push without someone holding him on the swing. He wrapped his arms around my legs and looked up at me with the biggest smile. And this is the part that is hard to admit as a parent. With Howie, I had decided he couldn’t do something. Everything about that testing scenario spelled trouble for him. I looked at the parts of his disability – the hyper-competitive nature, the inability to sit for that amount of time and attend to a task, the fine motor issues, the processing speed – and I decided he couldn’t do it. I knew he knew the answers and I wanted him to show the teacher that he knew the work without the interfering behaviors that keep him from showing he knows the work. Did he need to show that he knew the answers in the same way that every other kid in the class did? How many times did he need to not complete the task to show he needed accommodations? And did we need him to “fail” before we changed it, or was it better to start him off differently from the beginning? But he could do it like they did. Yes, it took him until the end of April. But the pride – the glow of accomplishment that he showed – would that have been there if he was doing the assignment differently than anyone else? So where do we step in? When do we say he needs to do it differently than the other kids? At what point do we acknowledge that “different, not less” is okay? Do we wait until Howie is self-aware enough to say “I can’t do this I need help” or I do decide that for him? Now with Lewis it was the opposite. I pushed for him to work through something that was uncomfortable for him. He was uneasy, afraid, and unsure of himself on that swing. But I asked the therapists to help him overcome it. I decided he needed to learn how to swing. Was that wrong? Would it be so bad if he never sat up on a swing? I am afraid of rollercoasters and any ride that spins. Would it be acceptable for Tim to hire a therapist to make me go on a rollercoaster because everyone else does? So what do I do? Where do I push? When do I intervene? When do I just let it go? When we cross off a goal on an IEP or home program, we call it progress. But at what cost? Or whose definition of progress? I want my kids to reach the next levels – to achieve the things I know they can achieve and more. To reach their limits and then feel confident to step over that line. But more than anything I want them to be happy. I don’t want them frustrated, scared, upset or angry with me or school. Or life. I need to figure out where my limit is too.